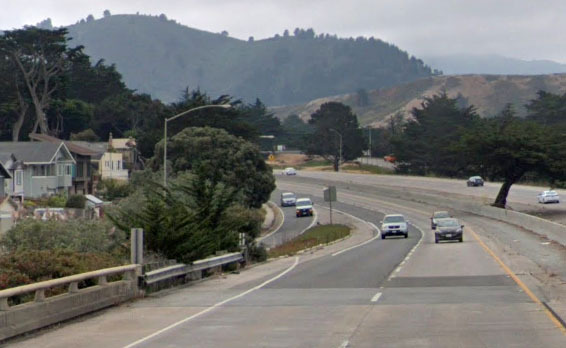 Two folks killed Saturday in a wrong-way crash on Freeway 1 in Pacifica have been recognized by the San Mateo County coroner’s workplace. Tulio de Giovanni Lima Viana, 23, of Daly Metropolis, and Megan Alyssa Cota, 23, of San Francisco, have been passengers in a Toyota Prius headed south in northbound lanes of the freeway, authorities stated. The 2 have been killed round 4:15 a.m. when the Prius collided head-on with a Chevrolet Silverado close to Clarendon Highway, in accordance with the California Freeway Patrol. Viana, who was within the again seat, was ejected from the automotive. A person believed to be Viana’s brother was driving the Prius, CHP officers stated. He was taken to San Francisco Normal Hospital, the place he was in vital situation Monday. Two males within the Silverado have been hospitalized with accidents not thought of life-threatening. The CHP is investigating the crash, together with how the Prius received onto the freeway headed the improper manner. Freeway 1 at that time is a divided freeway, two lanes in every course. Copyright 2019 by Bay Metropolis Information, Inc. — Republication, Rebroadcast or another Reuse with out the categorical written consent of Bay Metropolis Information, Inc. is prohibited. Previous articleCan thieves actually detect a laptop computer in a automobile trunk?